Join us for the opening of a specially curated photographic installation, hosted in partnership with the Brooklyn Queens Land Trust. The event will feature a special conversation with participating photographer Josué Azor. Josue Azor, born in 1986, is a self-taught photographer. 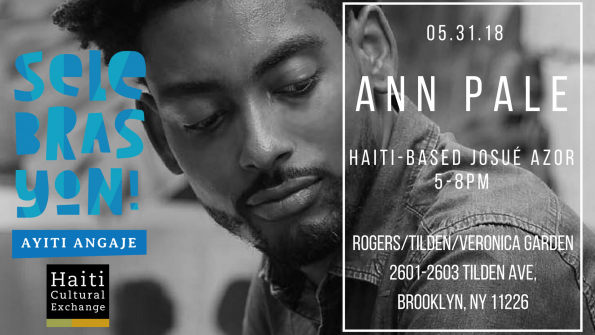 He has been traveling around Haiti since 2008, to merge his passion for photography and his appreciation of Haitian practices. His work has been exhibited regularly in Haiti, at the Brazil-Haiti Cultural Centre, the French Institute, and Fondasyon Konesans ak Libete (FOKAL). Internationally, his works have been exhibited in Rome, Italy (2010), Montréal, QC, Canada (2011), Durham, NC, USA (2015). This entry was posted on Thursday, April 12th, 2018 at 2:28 pm	and is filed under An n' Pale, Archive, Photography, Selebrasyon!, Visual Art. You can follow any responses to this entry through the RSS 2.0 feed. You can leave a response, or trackback from your own site.